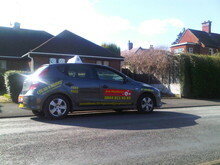 Over 250 pre-paid driving lessons remain unclaimed at Jon Matthews Driving School in Leicester. This is because over 40% of customers who bought four hours of driving lessons are yet start their driving tuition. The bulk of the driving lessons seem to have been bought by friends and family to be given as gifts or presents. In October, 2011, Jon Matthews Driving school sold over 600 hours of driving lessons in Leicestershire online via a third party. Unfortunately, the driving school does not have the names or numbers of the said purchasers. And the marketing partner is bound by contract not to reveal the email addresses where the driving lesson vouchers were sent. "We anticipated a big rush at the beginning. Redemption's were expected to plateau between December and early February with growing demand later in February. Unfortunately, unclaimed driving lessons stand significantly high." Jon Matthews Driving School is, therefore, calling on customers who bought the unclaimed driving lessons to get in touch, or remind their loved ones before it is too late. The driving lessons vouchers will expire on April 8th. With the volume so high, Mr. Matthews said he would hate to see learner drivers and their families out of pocket. "Driving lessons are becoming more expensive. It will be a shame to lose out on the deal only to go and buy them again at full price. We are, however, appealing to callers who have left it this late to be patient when they do call. As a result of the late claims learner drivers should expect a bit of a wait in getting actual driving lesson appointments. We operate on availability and "First Come, First Serve" principle. One thing we will not compromise on is the service to deliver fantastic driving lessons." Redemption can be made by calling the telephone booking line: 07806 193 453, the 24-Hour booking line: 0844 811 43 83, or by going online at www.jon-matthews.com as soon as possible. Based in Leicester, Jon Matthews Driving School offered to teach learner drivers in Leicester and neighbouring towns how to drive and pass the Theory Test part of their planned tuition. They also promised to prepare learner drivers for the subsequent practical driving test. So far, about five learner drivers have gone on to pass the Theory Test, since commencement of their driving lessons, and one of them has actually passed the practical driving test. "I cannot believe I am driving on a dual carriage way after eight hours!" So if you are one of those yet to claim your driving lessons, or perhaps know someone who hasn’t, get in touch with Jon Matthews Driving school.